Alif The Unseen is a story with a lot of depth. Many social issues are brought to the fore in an honest and believable ways. The characters while cold at first grow so much as things progress. You can feel them changing through the experiences they share. The setting is an Arab city where the divide between the classes is very apparent and is the closest I've glimpsed this society from the inside. Activism or hacktivism culture as it has become known as is at the center of things, but so is a magical world. Alif, the protagonist, learns that the two do not have to be mutually exclusive in his fight to stay alive. 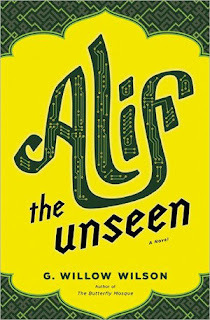 Alif The Unseen is many things. A cyber thriller, a peek into the Arab way of life, and a journey through the mythology of the middle east. And it does each equally well in what ends up being one of the most memorable stories I've read this year. Superb in nearly every facet. Simply, a brilliant cross of Hackers, Middle Eastern Society and Djinn. I can't wait to see what Wilson does next.